Yesterday I faced a moral dilemma. There was a huge pile of dishes, but we could of watched tv. I felt compelled to help, but I wanted to watch telly more. I got upset, because to be honest I wanted to help, because I didn’t want to be selfish, but I really wanted to watch tv. Maybe I should have been honest and not done it, because I didn’t want to. I don’t know, but I do know that the only way to be a light in the darkness is to be honest . I’m not always honest, but I’m going to try. 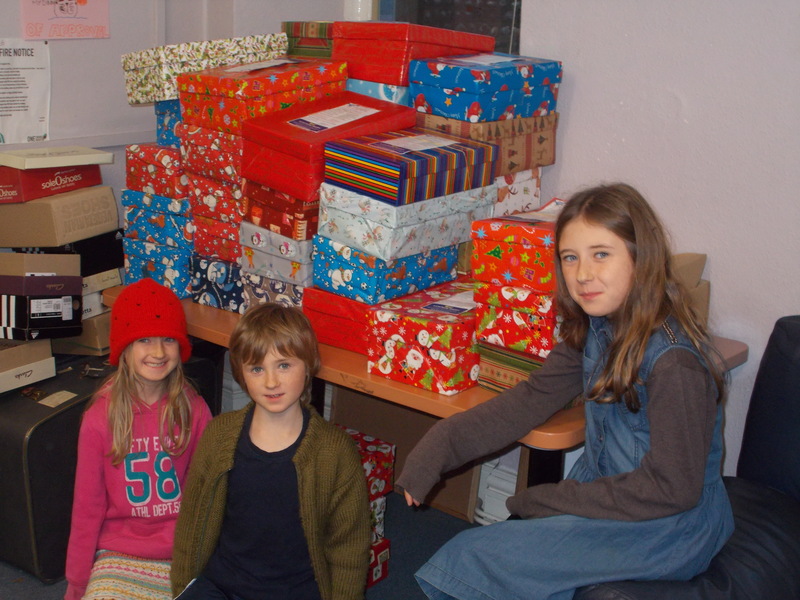 Recently me, Evan, Irys and mum went to our church to help them pack shoe boxes . They are working to help a charity called Link To Hope . 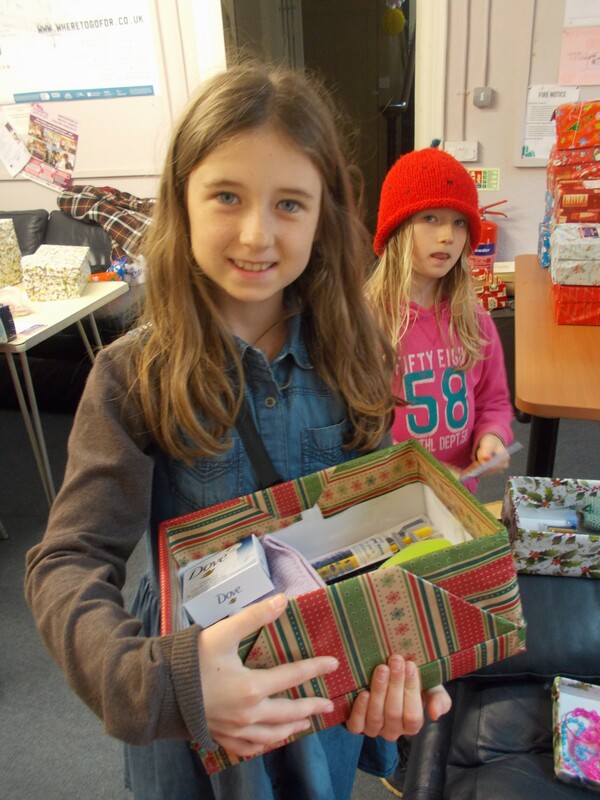 Every Christmas Link To Hope packs shoe boxes full of gifts to give to people in other countries. They send them to Ukraine, Moldova, Bulgaria and Romania. This year they are also going to send them to the Syrian refugee camps on the border of Turkey. The boxes are packed full of gifts and goodies and every day things for all the family. This year they have also created boxes for elderly people with added tissues, reading glasses and lavender bags . My favourite thing they packed in was a load of bags of knitted baby clothes. Someone had knitted bags and bags, hats, dresses, coats, cardigans, socks and gloves, all the colours of the rainbow. They were lovely. I really enjoyed helping, as it was fun to choose all the gifts and toys and imagine who would get them. It was also nice to get to work with the other people and chat while we worked. I hope the people that get the boxes are happy and that we’ve made a difference and given them a better Christmas. We were just coming home from granny’s house, we’d had a lovely time doing art, playing games, chatting, shopping, going to cafes and just hanging out. We were driving down the M25 in the pouring rain, the spray was everywhere and we could only see a few metres ahead. Suddenly mum’s windscreen wipers stopped working. Eeeeeek, we had to pull over. Sitting in the car, mum phoned the RAC and they told us to carefully get out of the vehicle and wait for them to come. Hurriedly we pulled on a coat, meanwhile the car was shaking violently as huge lorries thundered past. We went to stand in a overgrown jungle of weeds by the roadside and did a spelling bee while waiting for the bright orange van of the RAC. After 30 minutes of waiting they turned up and they’d fixed it in another half hour. Finally we were able to return home safely. I’m glad that the man managed to fix the car, but I was hoping the man would have to call a low loader and we’d get to ride in the RAC van. 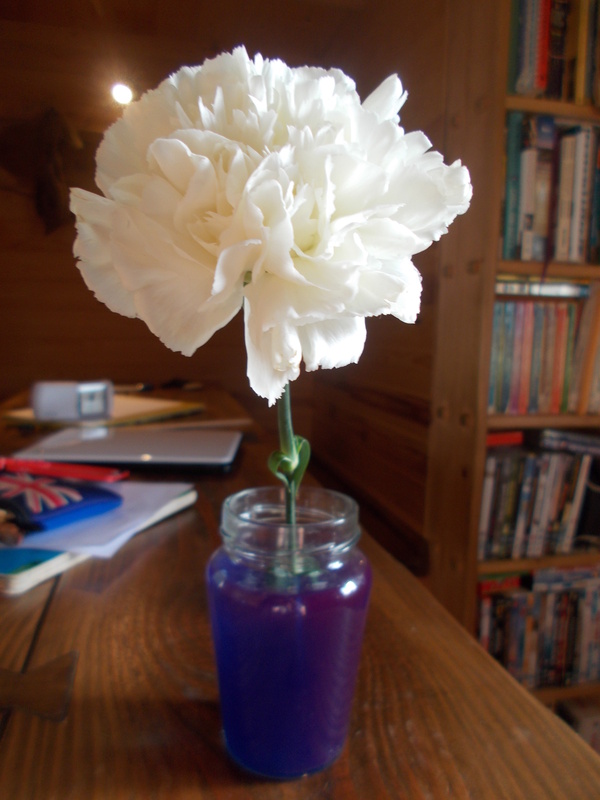 Recently as part of our science lesson we did an experiment where we took a white carnation, a jam jar, blue food dye and some water. We put a bit of water in the jar and and added 15ml of food dye. We then put in the flower in. The science book said it should have turned blue in an hour, but it didn’t. We tried a number of different things like splitting the stalk, adding the rest of the dye and then we tried diluting it, NOTHING happened. The only change is a few blue flecks on the edges of each petal. Are there any scientists, science enthusiasts or anyone out there who could give me a hand? I just wanted to say a BIG thank you to everybody who has liked, commented or followed my blog. I am new to blogging and I didn’t expect so much response,but I’m absolutely delighted!! I’m getting the hang of it now, so I’ll be making lots more posts. It’s going to get even better, so keep following!! and also a fierce thing. it can be life giving. or a ruler of the planets. Sun can be anywhere as long as you make it there and keep it there. 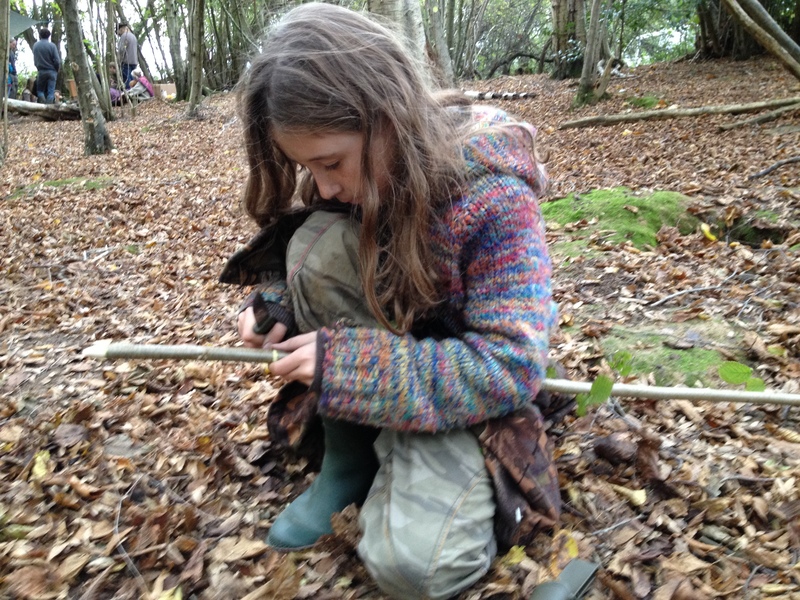 On Wednesday me,Evan,Irys and Mum went Mushroom hunting in Ashdown Forest. Alice and Ollie met us there, so did our friends Pete, Lily and Solara. It poured with rain!!! It was wet, windy, foggy and rainy, but we still collected loads!! I found this yellow/orange trumpet like one, Alice got excited she said it was a really good one called a chanterelle, but it turned out to be a false one, oh well. 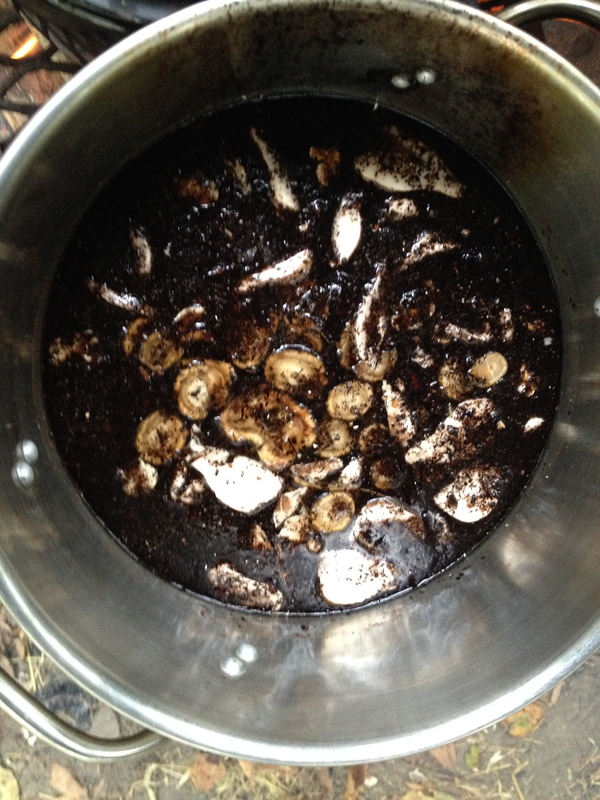 We also found boletes, ink caps, ganaderma, birch polypore etc. After we’d gathered our selection of fungi, brackets and mushrooms, we headed back to the visitor centre, soaked through, but really excited. We saw a lot of things that others had found such as beef steak mushroom , which is brown and if you squeeze it red liquid oozes out (like blood). Also if you cut it open it’s reddy brown and streaky just like meat!! 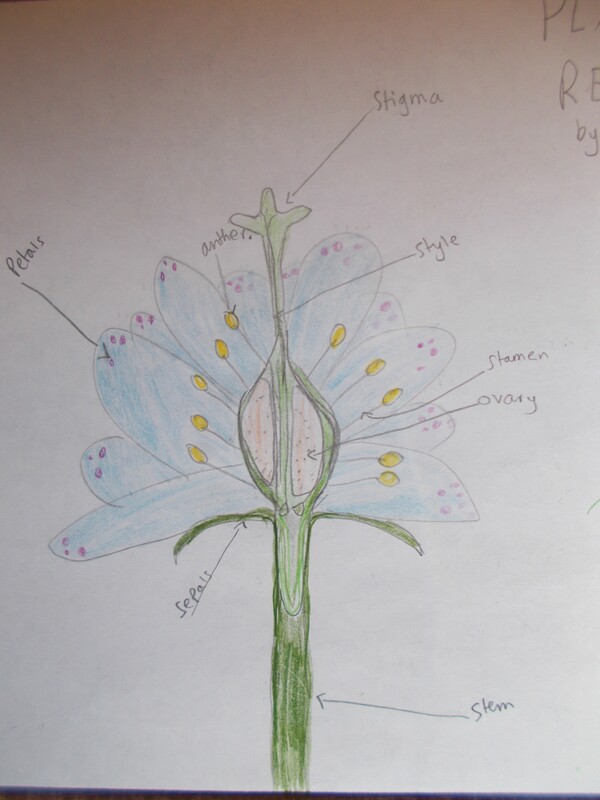 There was also a bolete that, when you cut it open, it oxygenised, it turned from pale yellow to bright blue!!! We also met a well known mycologist who helped us identify our hoard! Her name was Iona and she was really nice!! Last Sunday I went foraging with Alice on the farm where I live. We were learning about roots, acorns and medicinal mushrooms. 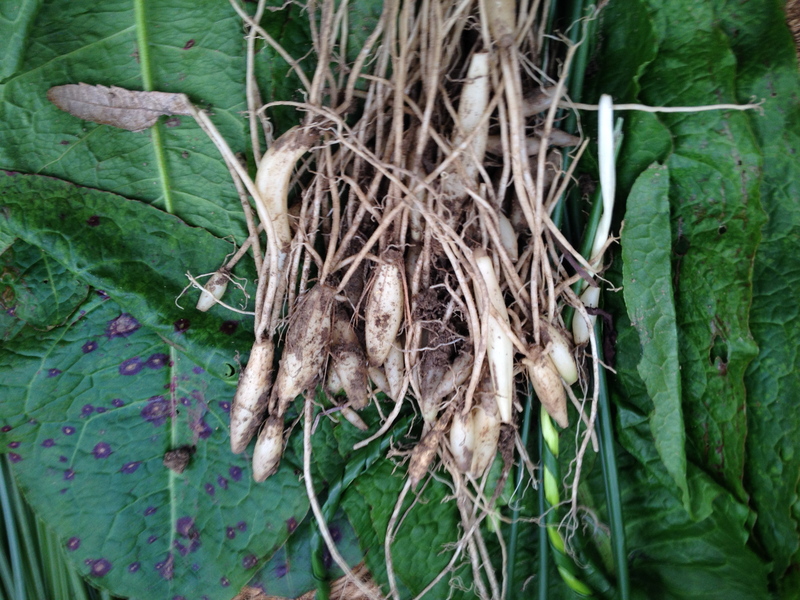 We dug up burdock roots and we each tasted a little bit of the leaf, it was so bitter!!! 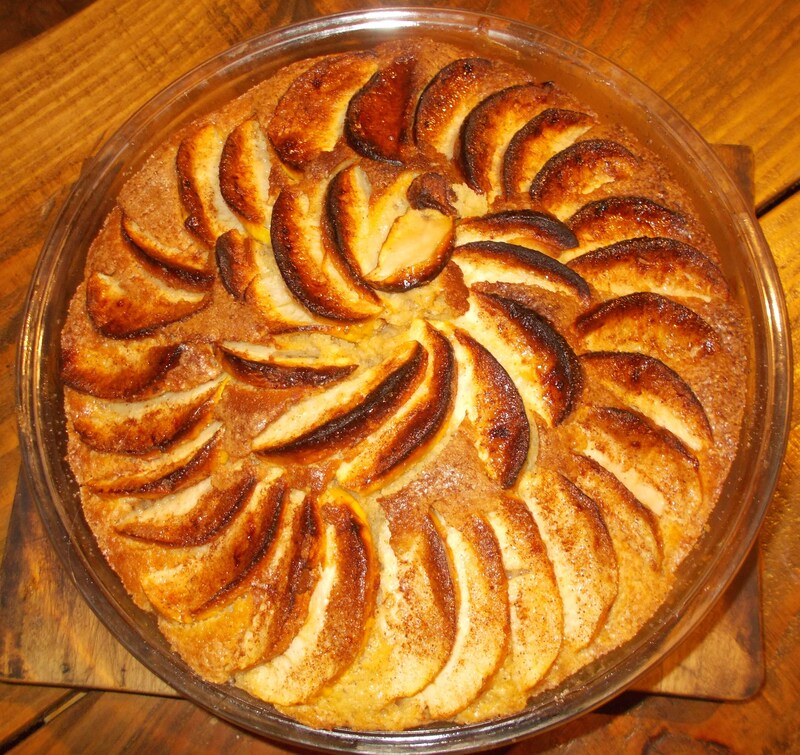 It felt like you could taste it more on the back and sides of your tongue. The back symbolises the intestines and the sides, the liver. Both places burdock is good for!! 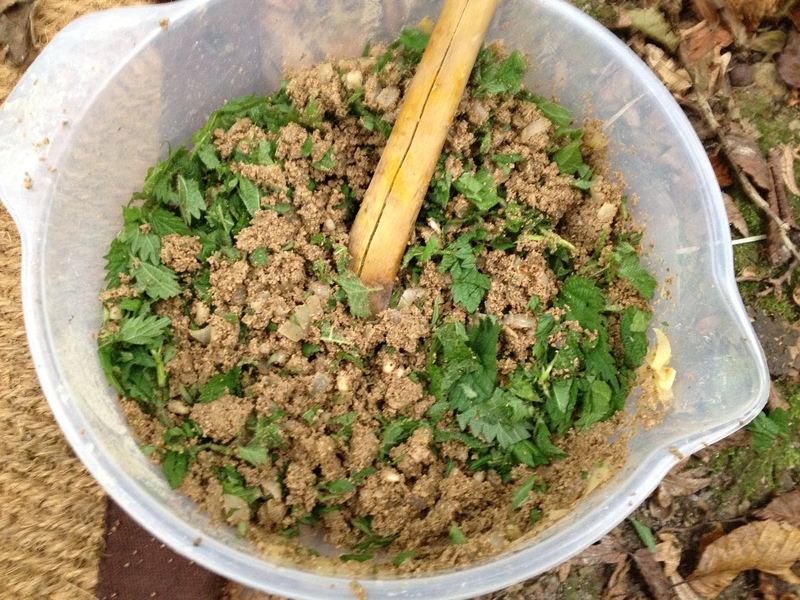 We also collected a few burs to sprinkle around and spread the seed. We learnt that they are sometimes called ‘ beggars buttons ‘ as people that couldn’t afford fine clothes with buttons used the sticky burs instead!!! After collecting various wild goods throughout the morning, we headed back to the camp in the woods to eat lunch, then we started making!! The kids made a fire, there were four of us, I lit it with a striker and a tinder bundle made of dried cleavers. We made a hazelnut oven, dug a pit, put the nuts in, covered it up and lit a fire on top!!! 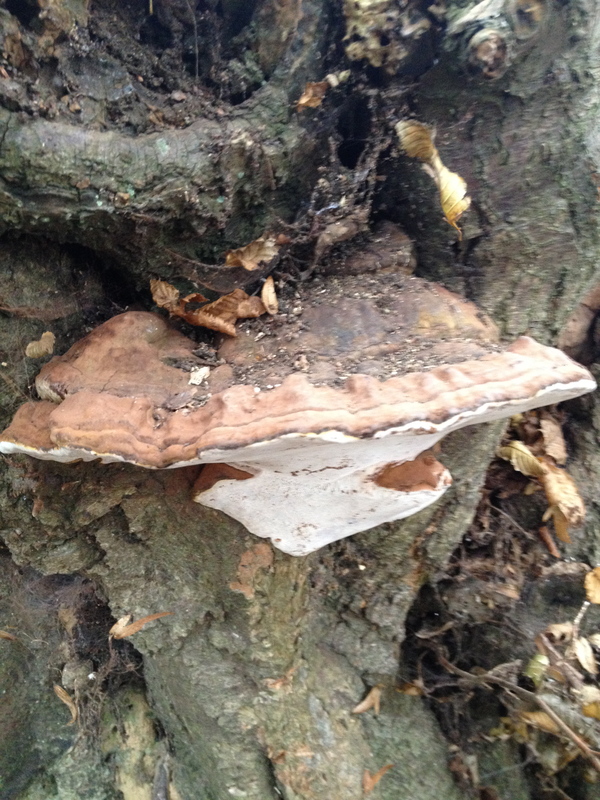 We drank delicious rosehip tea, ate acorn burgers, ate boiled burdock root and drank sweet birch polypore drink. All of these things were surprisingly tasty!! 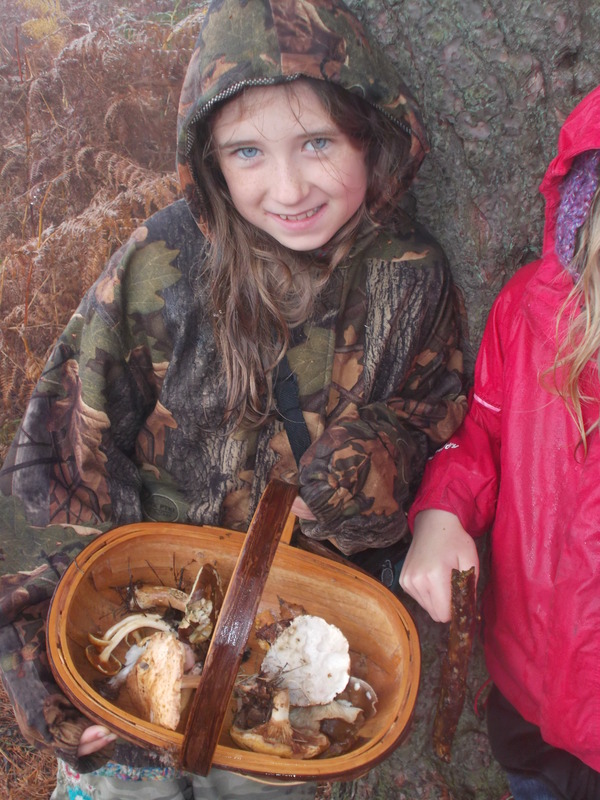 Us kids cut some hazel from a tree and sat and whittled while eating our nuts that we roasted!! Before we went home we were given a jar of stock made with a mix of turkey tail fungus, Ganaderma brackets and birch polypore!! I really enjoyed myself, thank you Alice for inviting me and thanks to Anna and Lucinda for running the course.